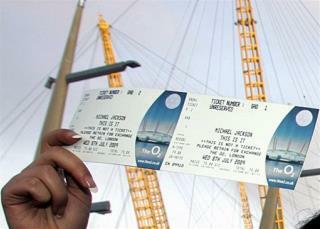 (Newser) – The 750,000 people in 200 countries who bought ticket vouchers for Michael Jackson's planned 50-gig comeback will be able to get full refunds, the Los Angeles Times reports. Promoters AEG Live say any fans who paid for tickets through authorized agents will have the choice of getting either their money back, including service charges—or the ticket as a memento of the late singer. Probably worth more right now. probably will be worth alot more than $125 in a years time.